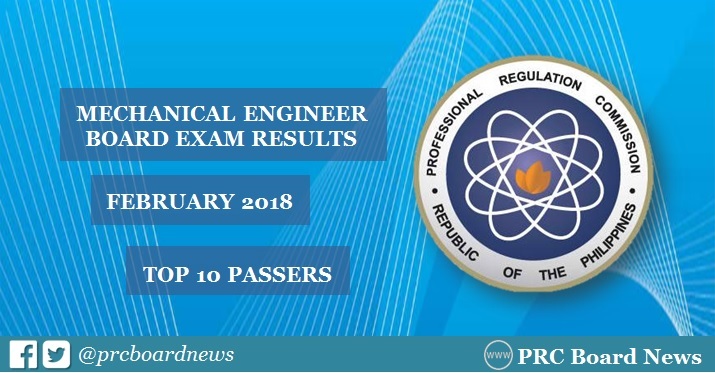 MANILA, Philippines - The February 2018 Mechanical Engineer (ME) and Certified Plant Mechanics (CPM) board exam top 10 or topnotchers including other results - list of passers, top performing schools and performance of schools are released online today, March 2 (Friday) or in three (3) working days after the exam. Kelvin Mendoza Macatangay from Batangas State University (BatSU) - Alangilan campus topped the board with 88.75%. Kyle Darryl Tan Aguilar of De La Salle University (DLSU) - Manila ranked second with 88.35%. The Professional Regulation Commission (PRC) administered the licensure exam in the cities of Manila, Baguio and Cebu on February 26 and 27, 2018. In the March 2017 ME board exam, University of Cebu in Lapulapu and Mandaue graduate Brylle Pahimutang Gilbuena topped the board with 88.10%. In March 2016, University of Cebu (UC) graduate Marina Melendres Luchavez got the highest spot with 91.60. In March 2015, Batangas State University (BatSU) alum Joerge Ryan Bermudez Maramot aced the board with 90.55%. Here's overview of topnotchers for ME board exam in the past years. Thanks you for sharing the article. The data that you provided in the blog is informative and effective. Through you blog I gained so much knowledge. Also check my collection at https://www.dnpcapstoneproject.com/find-out-50-more-nursing-leadership-project-ideas/. PRC result is prepared for the measurement of the grades of the people. It has been assumed for the visits of the http://www.psychologycapstoneproject.com/social-psychology-dissertation-ideas-and-writing-tips/ for the safe consumption in life. The matter is fixed for the attitude of the terms for the highs of the joy for the humans. The bored news and content is utilized for this struggle of the persons. It has been entailed for the use of the http://www.sopwritingservice.net/why-to-choose-our-sop-writing-services/ for all satisfied moments. The tinge is calculated for the width of the concepts for the use of the term for the humans. Very likely, physically fit instructors dependably underline on the prosperity of their understudies and reveal to them how to be http://www.mbapersonalstatement.org/mba-international-management-personal-statement/ reasonably and impressive fit. The supervision of educators about keeping up the wellbeing is sensible for the adolescents amazingly in this specific time. In all likelihood, science ask about spotlights are appearing on the planet since we a significant https://www.sopwriter.com/our-sop-writing-service/statement-of-purpose-for-phd-writing-service/ of the time observe some new progressions in the space of science which is mind boggling. In remedial science, we see that essentially dependably experts look for something new to fix the general open and welcome it structure heart.